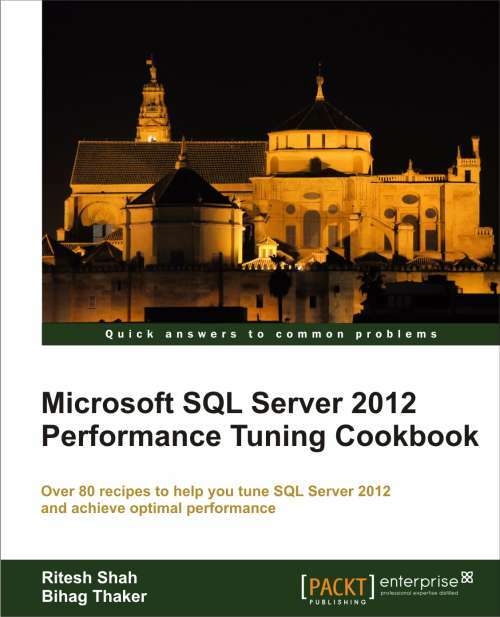 I have completed 350 articles on this blog and apart from that my book “SQL Server 2012 Performance Tuning Cookbook” has released yesterday officially. I would like express my deepest gratitude to all my blog readers and online SQL Server community which always inspire me to work hard and returning back to the community. In today’s blogpost I am not going to discuss any technical stuff but I would like express my truthful thanks to few person who has always played an important role in my life. Though I have expressed my thankfulness to them in the “Acknowledgement” section of my book, I can’t stop my temptation to express my gratitude blogpost. I would sincerely like to thank Packt Publishing, for showing their confidence in me and providing the invaluable opportunity of being a part of this book. Individuals at Packt whom I am deeply grateful to, are Kedar Bhat, Sai Gamare, Madhuri Das, Ashwin Shetty, Apoorva Bolar, and Dhwani Devater. They have been very co-operative and supportive at all the stages of this book. I am extremely thankful to Michael Zilberstein (Blog) and Maria Zakourdaev (Blog, Twitter) and Satya (Blog,Twitter) the technical reviewers, for their excellent work of getting the accuracy of the technical details of the book in perfect shape. I wouldn’t have been able to author this book alone, so thanks should go to Mr. Bihag Thaker, as well, as he agreed to co-author this book with me and has worked even harder on it than I have myself. Two individuals to whom I am indebted and whose disciple I have always been are Mr. Pinal Dave(Blog, Twitter) and Mr. Jacob Sebastian (Blog, Twitter). I have learnt a lot from them, and they are the reason I’m part of the IT community today. 1.) Pinal Dave, who blogs at SQLAuthority.com and is an author of several SQL Server books. Currently, he is working as a Technology Evangelist at Microsoft. 2.) Jacob Sebastian, who blogs at BeyondRelational.com and is a SQL Server MVP, book author, well-known speaker in SQL Server technology, and much more. Without my family support, a task such as writing a book would not have been achievable. I would like to heartily thank my parents, Mr. Ashwinkumar Shah and Mrs. Divya Shah. It is because of them that I exist, and I cherish their blessings, which are always with me. I would also like to thank my one-and-a-half-year-old son, Teerth, who used to often start crying at midnight, because of which I would lose my sleep and, not being able to get it back so started researching more on the subjects that helped me write this book. Last but not least, I would like to thank my wife, Alka Shah! Finally I would appreciate help and support of all my friends who has directly and indirectly helped me a lot. 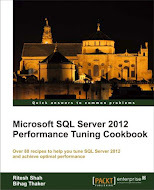 This entry was posted in SQL Server 2012, SQL Server Performance Tuning and tagged MS SQL Server, Ritesh Shah, sql server 2012 performance tuning cookbook on July 27, 2012 by Riteshshah. 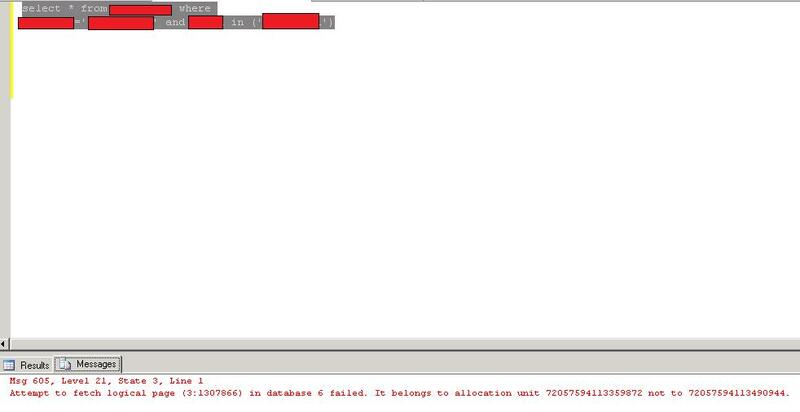 Attempt to fetch logical page (3:1307866) in database 6 failed. It belongs to allocation unit 72057594113359872 not to 72057594113490944. There was a festival holidays in our Indian office from 26thto 28th OCT 2011 (Wed/Friday) so obviously I was out of town and back after 5 days on 31st OCT 2011. 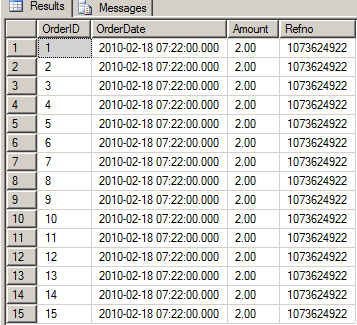 As soon as I come to the office and checked few of my email, I suddenly get complain that few pages in our software are throwing an error so I picked up the query which was there in those pages along with the same parameter they were providing and found the error given above. 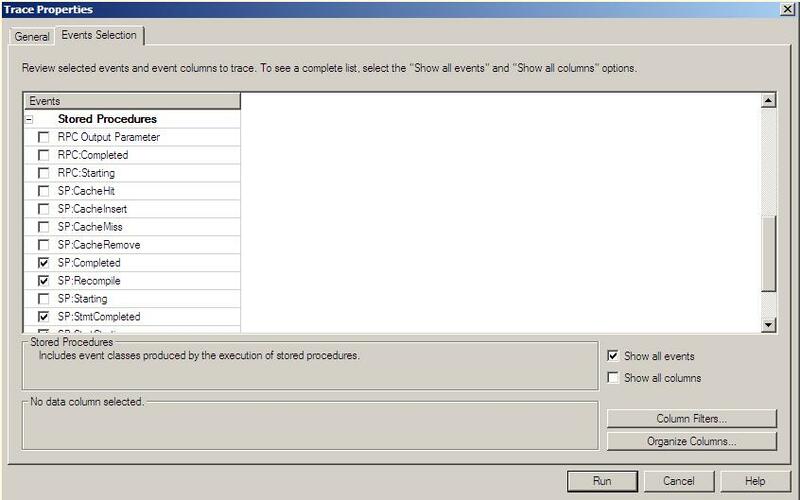 As soon as I read this error, I came to know that there is a page corruption in database. It may be due to heavy snow fall in NJ in October, they have got power failure there from few days and tried to keep the server up and running via power generator. As soon as Power Generator’s fuel get finished, everything gets down and after refuel, they starts everything again. I came to know this as soon as I come back from holiday. I think this is the Indian New Year gift to me. 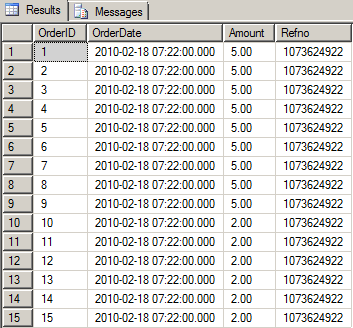 I tried to gather some more information about the data file and page number given in error message with DBCC PAGE command. You can use option 0,1,2,3 as the last parameter (bold 3) of DBCC PAGE command. I HIGHLY RECOMMEND to go for 1st option but if you are out of luck and don’t have last full backup, you must have to go for second way. I have restored page from my last full database backup with below given TSQL. Now, let us talk about second option if you don’t have full backup of your database. 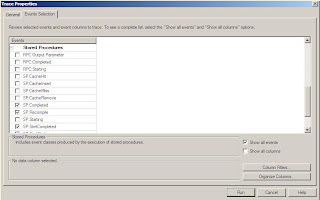 Use DBCC CHECKDB command. –it will only shows error messages and warnings. Once you execute above command, it will recommend you repair level. it may recommend REPAIR_REBUILD if you really lucky but if you will see repair level REPAIR_ALLOW_DATA_LOSS, you have to be ready to lose some of your data. You may use either of the below given command based on the Repair Level you have been suggested. 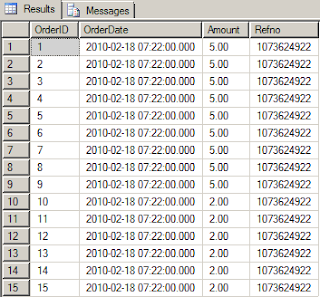 Moral of the story is, always have FULL recovery model for your database and schedule full/ transaction/ differential backup policy. This is a MUST DO for any DBAs. You never know, when will you need it!!!! 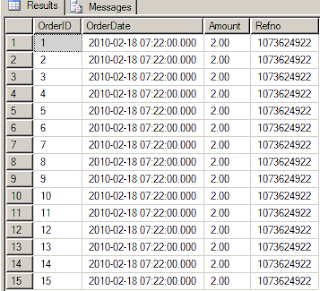 This entry was posted in Msg 605, sql server, SQL Server 2012 and tagged DBCC CheckDB, DBCC Page, MS SQL Server, Ritesh Shah on November 3, 2011 by Riteshshah.